Everyone was gawking at this peregrine falcon red-tailed hawk perched in a tree near the Smithsonian Metro exit on the National Mall yesterday afternoon. 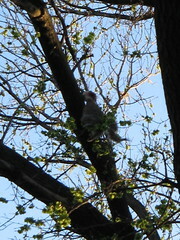 Hanging from a nearby branch were the remains of its latest meal: half a squirrel. 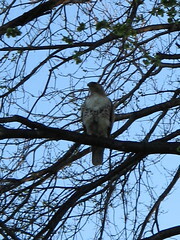 Update: Turns out this was a red tailed hawk, not a peregrine falcon. I’ve updated the entry as needed. That’s awesome. I saw this hawk near my house about to pounce on this house cat. It was pretty freaky.